In this image, VAMPs are shown actuated and cut open in cross section. The cross section shows the inner chambers that collapse when vacuum is applied. Credit: Wyss Institute at Harvard University. To make robots more cooperative and have them perform tasks in close proximity to humans, they must be softer and safer. A new actuator developed by a team led by George Whitesides, Ph.D. — who is a Core Faculty member at Harvard’s Wyss Institute for Biologically Inspired Engineering and the Woodford L. and Ann A. Flowers University Professor of Chemistry and Chemical Biology in Harvard University’s Faculty of Arts and Sciences (FAS) – generates movements similar to those of skeletal muscles using vacuum power to automate soft, rubber beams. Like real muscles, the actuators are soft, shock absorbing, and pose no danger to their environment or humans working collaboratively alongside them or the potential future robots equipped with them. The work was reported June 1 in the journal Advanced Materials Technologies. Whitesides’ team took an unconventional approach to its design, relying on vacuum to decrease the actuator’s volume and cause it to buckle. While conventional engineering would consider bucking to be a mechanical instability and a point of failure, in this case the team leveraged this instability to develop VAMPs (vacuum-actuated muscle-inspired pneumatic structures). Whereas previous soft actuators rely on pressurized systems that expand in volume, VAMPs mimic true muscle because they contract, which makes them an attractive candidate for use in confined spaces and for a variety of purposes. 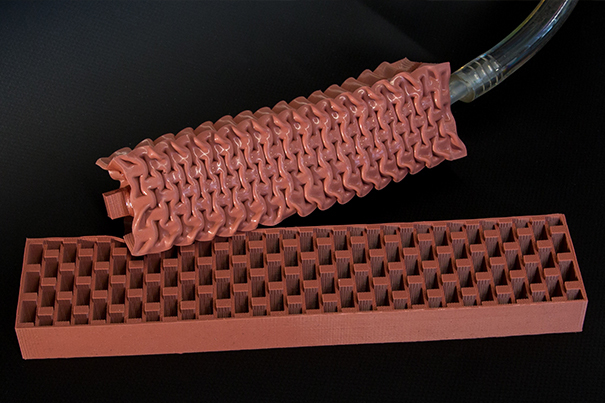 The actuator — comprising soft rubber or ‘elastomeric’ beams — is filled with small, hollow chambers of air like a honeycomb. By applying vacuum the chambers collapse and the entire actuator contracts, generating movement. The internal honeycomb structure can be custom tailored to enable linear, twisting, bending, or combinatorial motions. “Having VAMPs built of soft elastomers would make it much easier to automate a robot that could be used to help humans in the service industry,” said the study’s first author Dian Yang, who was a graduate researcher pursuing his Ph.D. in Engineering Sciences at Harvard during the time of the work, and is now a Postdoctoral Researcher. The team envisions that robots built with VAMPs could be used to assist the disabled or elderly, to serve food, deliver goods, and perform other tasks related to the service industry. What’s more, soft robots could make industrial production lines safer, faster, and quality control easier to manage by enabling human operators to work in the same space. Although a complex control system has not yet been developed for VAMPs, this type of actuation is easy to control due to its simplicity: when vacuum is applied, VAMPs will contract. They could be used as part of a tethered or untethered system depending on environmental or performance needs. Additionally, VAMPs are designed to prevent failure — even when damaged with a 2mm hole, the team showed that VAMPs will still function. In the event that major damage is caused to the system, it fails safely. “It can’t explode, so it’s intrinsically safe,” said Whitesides. Whereas other actuators powered by electricity or combustion could cause damage to humans or their surroundings, loss of vacuum pressure in VAMPs would simply render the actuator motionless. “These self-healing, bioinspired actuators bring us another step closer to being able to build entirely soft-bodied robots, which may help to bridge the gap between humans and robots and open entirely new application areas in medicine and beyond,” said Wyss Founding Director Donald Ingber, M.D., Ph.D., who is also the Judah Folkman Professor of Vascular Biology at Harvard Medical School and the Boston Children’s Hospital Vascular Biology Program, as well as Professor of Bioengineering at Harvard’s John A. Paulson School of Engineering and Applied Sciences (SEAS). In addition to Whitesides and Yang, other authors on the study included: Mohit S. Verma, Ph.D.,(FAS); Ju-Hee So, Ph.D., (FAS); Bobak Mosadegh, Ph.D., (Wyss, FAS); Christoph Keplinger, Ph.D., (FAS); Benjamin Lee (FAS); Fatemeh Khashai (FAS); Elton Lossner (FAS), and Zhigang Suo, Ph.D., (SEAS, Kavli Institute).